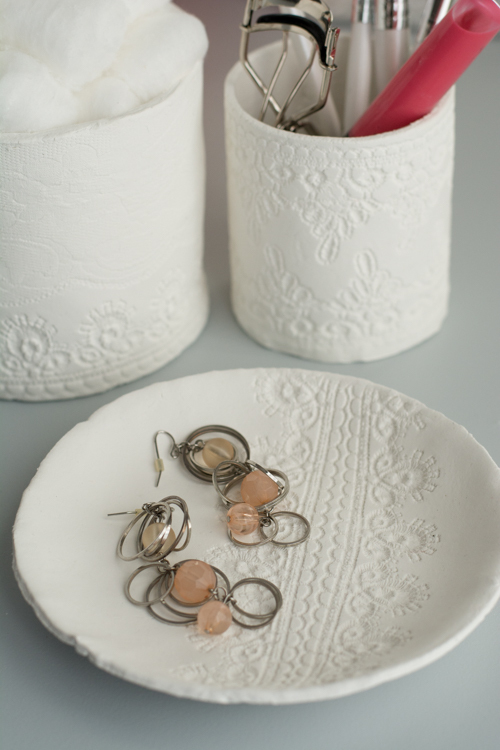 I could tell you that this clay containers project came about because I wanted to organize my makeup drawer (and I do need to organize that drawer), but the truth is, I got the idea to imprint lace into clay, and wanted good excuse to try it. Hah! 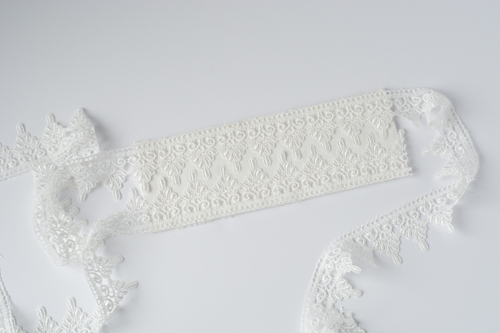 A few months ago, I came across a plate that had a crocheted doily imprinted onto it, and I wondered if lace would work just as well. So I combined some lace samples from the fabric store with air-dry clay, and tada!, now I have the cutest little set of containers in world. I’m using them here for makeup brushes, cotton balls, and jewelry, but I’m sure these clay containers would work fabulously on a desk as well. Air-dry clay is so easy to work with. Just sculpt and allow to fully dry. It is easy to manipulate and holds texture well. Oh. And did you know air-dry clay can be tinted any color you like? I’m kind of into the ceramic look of the plain white, but if you’re craving color, the skies the limit with this clay containers project. Roll out the clay. Cut a circle for the base. Set it aside. (You might want to store it in a plastic baggie just to keep it from drying out.) 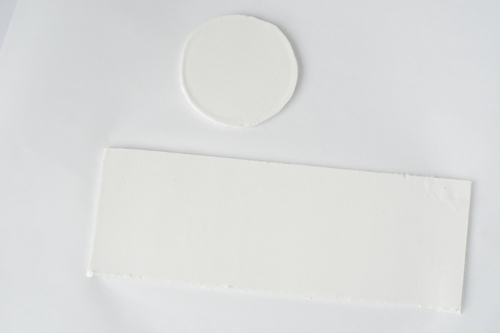 Cut out a rectangle to the height you want and wide enough to wrap around the container you’re using for a mold. 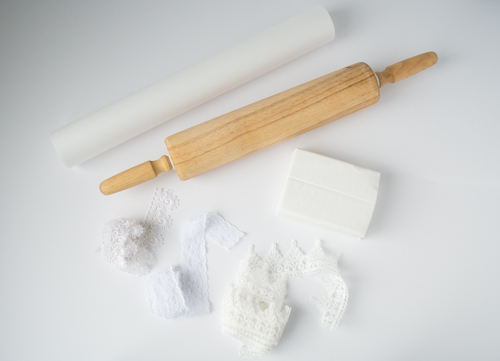 On the rectangle, lay out the lace and roll with a rolling pin to make an impression. Wrap the rectangle around the container mold and use your fingers to connect the seam. The damp towel might be handy right now. Because the clay gets a little dried out while you work, use the towel to dampen the edges before connecting them. They will stick together better and more easily when if they are a little damp. Then place the base circle onto the cylinder. Again, use your fingers to connect the seam all the way around. The damp towel is good here too. For the circle dish, cut a circle and then lay in a dish of your desired shape. Use your fingers to gently press the clay circle into the dish form. Allow the clay containers to dry according to the manufacturer’s directions. I found it best to leave the mold container in place until it’s dry, to make sure it doesn’t slump. Remove the jars from the molds and then fill as you wish. 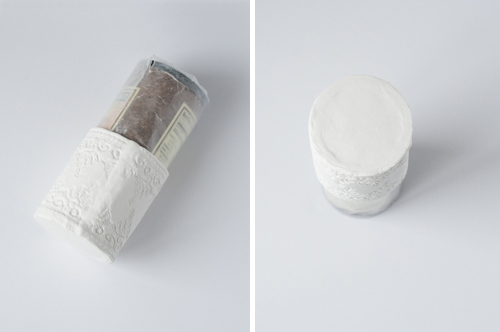 These clay containers is such a fun project — it can be used in so many ways. I think it would be cute to do in a classroom — maybe have the kids make these as mother’s day gifts. Or it would be a fun activity at a girly birthday party. Or you could even make these as little planters to decorate a table at a wedding feast, fill them with mini succulents and then give them to guests as a party favor. 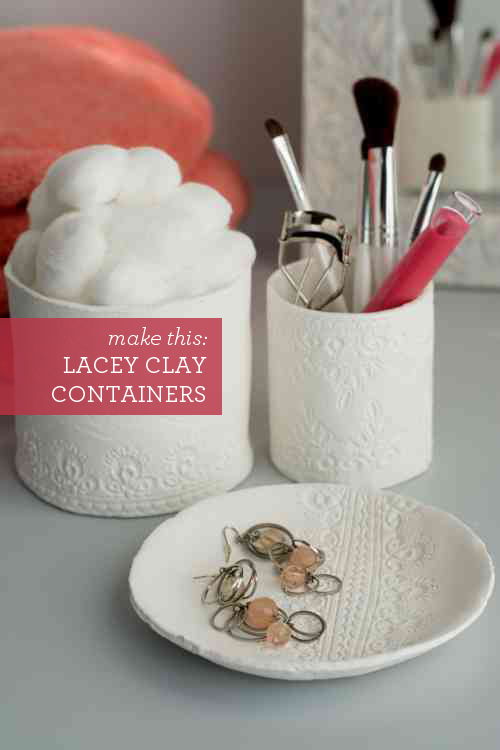 As usual, if you try this lacy clay containers project, I’d love to hear. Feel free to send pics! P.S. — Like to make things? Find all sorts of wonderful projects here. These are stunning. I’ve been on the search for simple white (inexpensive) planters for months and I think I’ll try this instead! Quick question–onece the clay is dry, how does it hold up to water (dirt, moisture, etc.)? Unfortunately, air dry clay won’t hold up to water (at all). Only clays fired in kilns at very high temperatures and glazed will be water-safe. Perhaps you could fit the inside with a small jar to hold the dirt and water? Thanks for jumping in with an answer Elisabeth! It was a crazy week, so I appreciate the help. I love this!! It is so pretty, yet understated. I’m not super crafty, but I am going to try my hand (s) with this! Lovely! If you were to tint the clay, what would you use? Also, where are those coral towels from? Lovely! Hi Sarah! The towels are from Target. 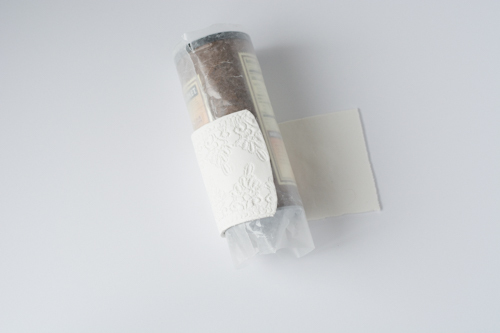 As for tinting the clay, after it dries, you can use watercolor, acrylic, and these paints. I hope that helps! These are so pretty and simple. Great idea! These look so lovely! Love this idea for organizing makeup! I am loving these! They look so pretty, I can’t wait to make some for my bathroom! Oh goody! So glad you like them. I hope you’ll send me a photo when you make some. Air drying clay is such a fun medium to work with – for both grown ups and kids. You’ve got me thinking me need to get the clay out again and make more leaf impressions but this time turn them into little dishes and cups. 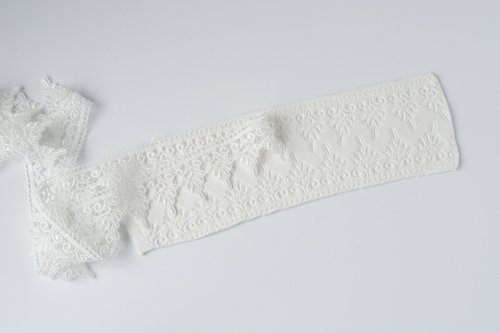 Hi Gabrielle, love your post about the lacy air dried clay. So cute, can’t wait to try it. Bty, I live in Oakland KY. I love this project. I will try to have beautiful pots for my brushes. Could it be waterproofed by sealing with a matte acrylic? Mother’s Day and Clay – user's Blog!